This week, I'm excited to have Lindsay dishing out some real moments of motherhood to us all. I feel like it was just yesterday that I was following along with her every week of her pregnancy, and now, she's a baby mama to Miss Ruthie, whom I've loved getting to watch grow over the past couple of months. Seriously, have you seen Ruthie's big gorgeous eyes? Little boys everywhere.... watch out! Lindsay does an amazing job of photographing 'Ru', as she's so sweetly called, and sharing tid-bits of their life as she navagates motherhood, on top of, being one of the co-founders of The City Flea. 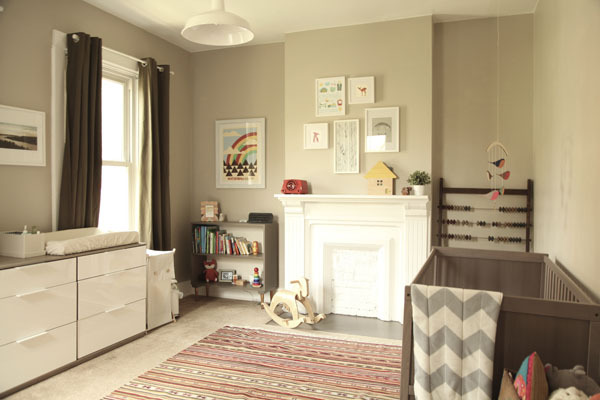 You can see her amazing eye for furniture and design in the photo of Ruthie's nursery below. Thanks for sharing your wisdom with us Lindsay! Ecstatic. We were just beyond excited - my husband too, seriously. When you try for months to have a baby and take a handful of failed pregnancy tests then read that one (or three) that say positive, it's impossible to be anything but over the moon. We wanted our baby girl so badly and that afternoon we found out, we sat in her empty bedroom dreaming of what it would be like in nine months with her in it. Turns out it's pretty fantastic. I've only been mothering now for a little over two months, so I can't offer much up in the 'if I had to raise my kids again this is what I'd do', but I will say that as far as labor and delivery goes- be open minded! I was certainly not open to a c-section and guess what happened? I was induced, labored, and ended with a c-section. That's pretty far from the 'let's try the natural thing' as you can get, but you know what? I got my baby girl safely in the end, and for that reason alone, I'd do it all again the exact same way. You can’t possibly raise a child without …. My Moby Wrap and ErgoBaby carrier. I knew I would like wearing my baby, but I didn't realize how much she would like it too. You put her in that wrap and bam, lights out. The closeness and warmth you both feel is so special and unique. I think I have to say Bleubird on this one. I feel like our parenting styles are similar, that we share the same opinion on a lot of things and James has been around the block as far as child rearing goes, so I always take her advice and tips to heart. Plus, she takes some pretty amazing photos of her children and their family adventures. Palmer's Stretch Mark Cream- I'm not sure if I've just got great genes (thank you, mom!) or if this stuff actually works, but I am happy to report I have not one stretch mark- I think that cream really works, guys. Epic fashion emergency/meltdown during either pre or post pregnancy? Leggings are not pants but they certainly are when you're in the third trimester and can't find a pair of maternity jeans that fit right to save your life. I had many mornings staring into the closet shouting, I DON'T WANT TO WEAR LEGGINGS AGAIN! But then, 5 minutes later, I was wearing leggings. (Thank goodness for me, it was not summer). Do you have any idea what it is like when your milk comes in? You think when you're pregnant, 'oh yeah, after I have the baby I'll just put her right on up here and she'll just start feeding and things will be hunky-dory.' That is, until you realize you don't have any milk until about day 4 or 5, and then kaboom.... all of a sudden your husband looks at you and goes, "holy sh*t Dolly Parton!".... it's actually kinda funny.